Near Miss, Good Catch Helmet Stickers - J.J. White Inc.
For almost 100 years our company has prided itself on putting “Safety First.” Our beliefs are anchored by the saying, “If Safety is not a value in your daily life, then life has no value.” Our employees are our most valuable asset, and our goal is to send each one home safely after they put down their tools for the day. Safety must be the first thought of every person on the job site. In order accomplish this, we implemented our NMGC program. The program stands for “Near Miss, Good Catch,” and helps field employees to prevent incidents from happening before they occur. This keep our workers alert to unusual activity on the job site, and protects them and their coworkers from becoming injured. Each week, employees submit NMGCs that are then reviewed to see which submissions prevented the most danger. The incentive to keep this program running effectively is the cash prize that the winner receives at the end of the week. In order to further recognize and identify safety leaders throughout the company, the Helmet Sticker program was brought in to mimic the stickers that are often found on college football helmets. Players receive these stickers for on-field achievements as well as leadership. Identifying these contributors is crucial to building the team and leadership culture that we want to maintain here at JJ White Inc.
Our first Helmet Sticker recipient was Bill Richart from our PES jobsite. While preparing for a fresh air job, Bill noticed that the two scaffolds intended for use were undersized and did not provide two forms of egress. 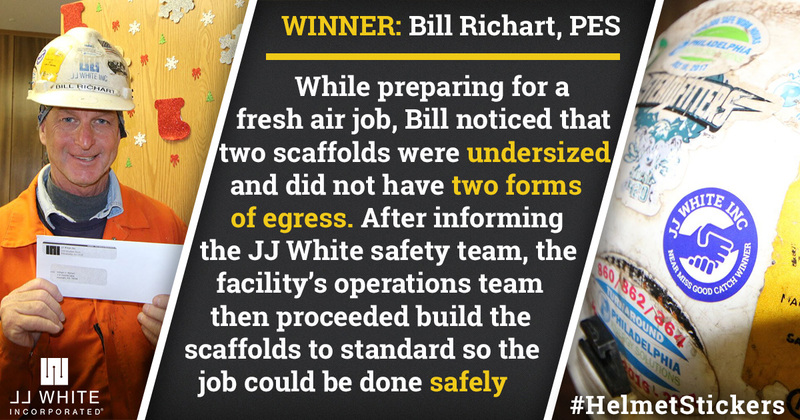 Bill informed the JJ White safety team who then contacted facility operations who got the scaffold up to proper code. 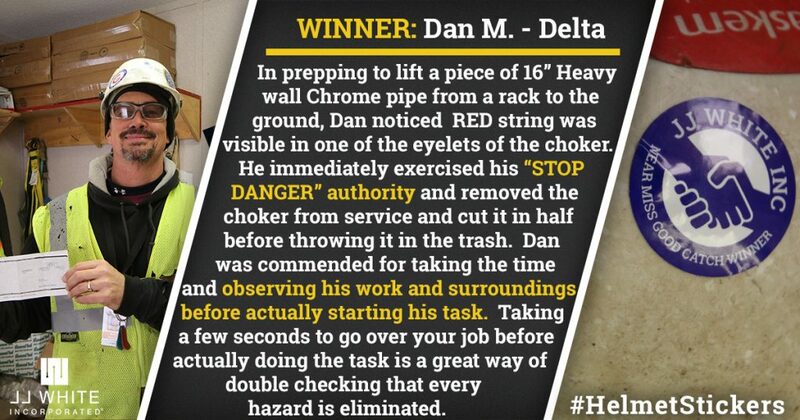 The first winner of January was Dan Migliocco, from our Delta site, who was in the process of prepping to lift a piece of 16” Heavy Wall Chrome pipe from Rack #8 to the ground. As he was preparing to lift this piece he noticed RED string was visible in one of the eyelets of the choker. He immediately exercised his “STOP DANGER” and removed the choker from service. He cut it in half before throwing it in the trash. He was commended for being aware of his surroundings before completing the task at hand. In the week to follow, Scott Werkhieser, from our PES site, was removing the E-201A Exchanger from its shell when he noticed distribution piping coming from a blinded Flange. 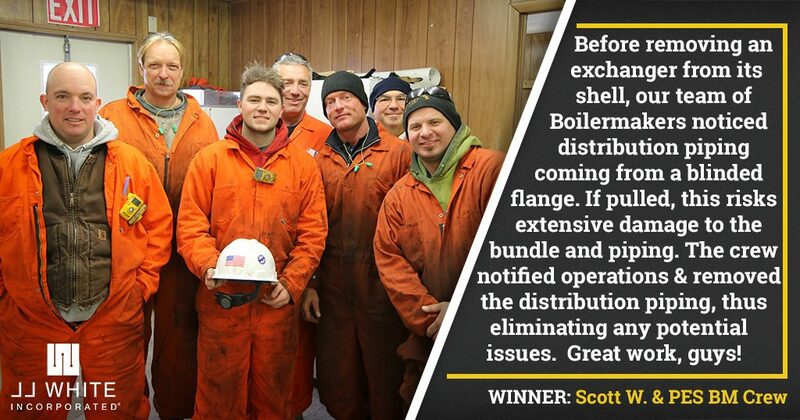 If Scott would have continue to pull the Exchanger without removing the distribution piping, extensive damage would have occurred to the bundle and piping. The distribution piping was removed before the Exchanger was pulled.